My work has its foundation in botanical art, a centuries old tradition originally used by naturalists to explain and document flora. Botanical work is quite separate from flower painting and landscapes, in which the artist is given a great deal of freedom in interpreting, changing, or enhancing the subject, according to the artist’s mood or inclination. 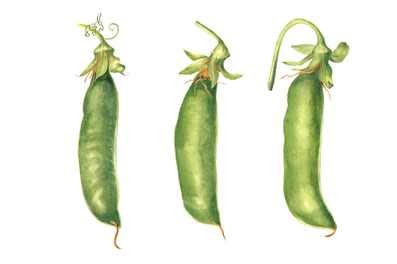 In botanical art, the artist must stay true to the flower or plant, accurately communicating the structure and growth patterns, the number of petals, the way leaves emerge from the stem, how the plant’s stamens and pistils appear. The image should be anatomically correct, but done with an artistic sensibility. When I began studying art, I was drawn almost exclusively to the natural world — I wanted to paint the flowers in my garden, or the vegetables I eyed in the market. My art teacher at the time wisely steered me to botanical art classes at Otis College of Art and Design. I quickly discovered that I had found my home in the art world, and I haven’t strayed. The choice makes sense for me: I have a strong scientific and analytical bent (at onetime I was a researcher in biochemistry and then a biology teacher). And, fortunately, I seem to have the patience and concentration required for the deliberate process of drawing and painting that’s needed in this discipline. I always work with the actual flower, vegetable or plant in front of me, which means that at the beginning of a piece I have to work in a very focused way to get the drawing done before the rose wilts or the cantaloupe is past its prime. Once I have a good drawing, I can use different samples of the same species to match for color and texture. Drawings and paintings take a long time to complete because the graphite or color is built up slowly, layer upon layer, in a gradual and controlled way. Pencils and pen drawings can take 40-50 hours; watercolor paintings take 80-100 hours. But every minute of creating is a pleasure. I hope the finished art provides the same measure of pleasure in viewing.